Won't replace your actual lighting in your living room or kitchen, but it’s one of the most versatile smart lighting products we’ve ever seen. Can be cut down or joined up to allow you to create desired strip length. Controllable from your smart phone or smart speaker. Can be synched to a variety of games, movies and music. Cable to the power point may be visible. Philips Hue is a smart lighting system that you can control from your smartphone or with your voice using a smart speaker, and there’s an expansive range of different lighting options within the family of products. TechRadar's James Peckham reviews the Philips Hue Light Strip here, tells you whether it’s worth the money and, of course, gives you his verdict so you can decide whether these are made for you. You might like to check out our review of the Philips Hue Starter kit, too. For more information on choosing the best lighting systems for your home, browse our specialist guide. You'll find plenty more reviews and buying guide in our technology hub, too. The Light Strip from Philips Hue is one of, if not the most versatile product we’ve seen in the Philips Hue collection (which includes the Hue Starter Kit bulbs or the Philips Hue Go, also reviewed). It’s exactly what the name suggests – it’s a strip of lighting that you can put around furniture, under cabinets and a variety of other places in your home. For example, you can use this to run along the bottom of your kitchen cabinets to give an alternative lighting effect to your normal kitchen bulbs. The original Strip Light is 2m long, 1.4cm wide and 0.5cm thick with a sticky back that allows you to easily attach it to areas in your home. This is quite easily removable, but we wouldn’t recommend it so have a long think about where you want to place it before you do. If you need the Light Strip to be shorter, you can cut the kit to the exact size you want. You can’t currently buy longer light strips for larger jobs, but you can attach separate 1m-long extensions. These are easy to connect, and you’re able to link up to eight of them, giving you a total of 10m to play with. The whole strip will work as if it’s one device, so if you change the colour the entire strip will do it simultaneously. We like how this can fit in so many locations around your home, but just remember you will need to attach the cable to a power socket and that may ruin the look a little. The lights include over 16 million different colours (that’s something you can access with the smart features we’re about to explain). We found the white light to be bright enough to see in your home (it’s 1600 lumen which is around average for most bulbs), as well as providing aesthetic lighting in your chosen room. To use the smart features provided by the Philips Hue Strip Light, you’ll need a Philips Hue Bridge. This is a connector that comes in the Hue Starter Kit (or you can buy it alongside the Strip Light if this is your first foray into Hue products) and it’s how your lights connect to the internet. When you’ve connected it to the Bridge, this will work differently to just a lighting system that turns on or off. You’ll be able to control it from your smartphone or a smart speaker and that opens up a variety of other features. The Strip Light is useful for lighting your home with white light without these smart features, but if you want to make the full use out of it we’d recommend connecting it up to a Hue Bridge. You’ll be able to control your lights from an iOS or Android phone using the Philips Hue app, or you can use your Amazon Alexa, Google Assistant or Apple Siri smart home speaker. Want the lights to set a mood on an evening? Ask Alexa (or any of the other assistants) to turn your Hue lights green and she’ll be able to do that. You can ask the assistant to make them brighter, warmer and a variety of other features too. One of the best elements of the Hue system is the fact you can set your lights up on a timer or turn them on by pressing a button within the app. It means you can have your lights on when you’re away so it looks like someone is home, or you can have them on ready for when you return home at night. It’s a useful feature that allows you to turn them on anywhere in the world and give yourself some peace of mind that it’s acting to deter burglars. One particularly interesting feature with the Hue Light Strip is the fact you can sync it up to a variety of games, movies and music to give innovative lighting around you while you’re playing, watching or listening. Say you’ve run the light strip around your computer desk, you can then connect it to an app called Hue Sync that with tailor your lighting to whatever’s playing on your monitor. It means the lighting will switch to darker shades when a physically dark scene in a movie comes on, and get brighter when similar happens in the film. It can sometimes make the experience more immersive, but this experience doesn’t work for everything and currently it’s only easy to set up on your Mac or PC. We’d love to see this feature soon come to smart TVs and games consoles so you can do a similar thing around your TV set. Running the light strip along the bottom of your TV cabinet is still an interesting idea though and you can choose your own lighting this way to light up whatever you’re watching on screen that evening. At first, the Philips Hue Strip Light looks like it can only be used for specialist scenarios. It’s true this isn’t the perfect option to replace your actual lighting in your living room or kitchen, but it’s one of the most versatile smart lighting products we’ve ever seen. 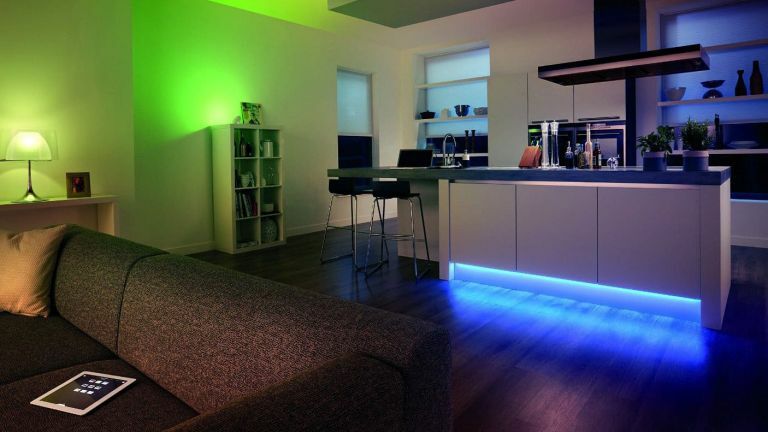 Connecting this to your kitchen cabinets, behind a TV or even alongside part of your bedroom allows you to create some fascinating scenarios for your lighting and makes it one of our favourite smart lighting products we’ve used. If you’re looking for an artistic way to light your home, the Strip Light may be the way to go allowing for a variety of different options and you can really get creative with where you place it. This won’t be a must-have for everyone, but once you’ve got an idea this can be a great way to make it happen. Looking for more smart tech reviews and buying guides?